There are ebbs and flows to parenting. Times of high concentration and focus on one or the other of our kids happens cyclically it seems and with the prospect of an empty nest in our immediate future coming this fall, I am especially in tune with these moments with my son, Ben. During my wife and my Saturday morning coffee yesterday, we agreed on how nice it was to have a couple of one-on-one years with Ben, while Sarah is off to college. Despite the door always swinging with his comings and goings, the time we do have with him has been rich and gratifying. And while I love both of my kids. this week was one of high contact with Ben and I have to admit it was what I needed. We tend to cruise through our day-to-days sometime and forget to stop and talk - catch up on where each of us is really at. So this was good. 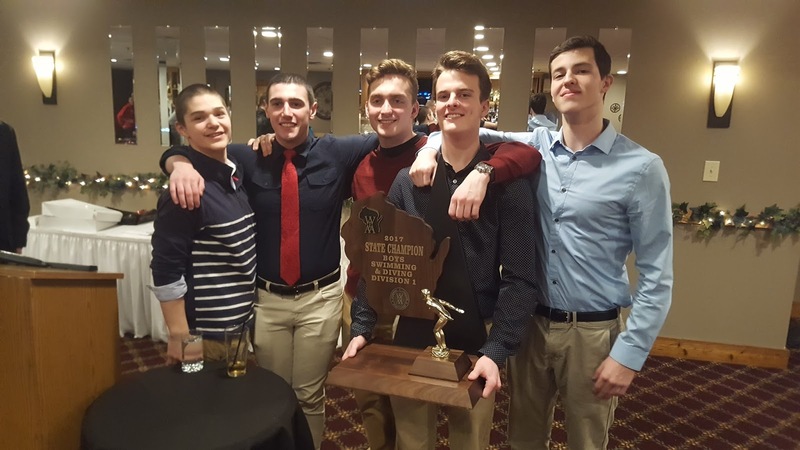 It started on Wednesday evening when we went to the Journal Sentinel Sports Show. This has become an annual event for the two of us over the past five years. We usually go out to dinner beforehand and then spend a couple hours walking the floor of the sports show. I was joking with him that the sports show is kind of like my "shopping mall experience" where I go to dream about buying things that I don't need and can't afford to impress people I don't care about. We hit all the usual spots like ogling the $45,000 boats, checking out the knives and guns, and challenging each other to the BB gun shooting range. He beat me again this year, as it seems one of my shots missed the target completely. This explains why I fish instead of hunt. 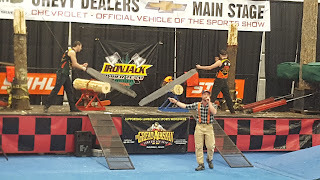 One of the funnest things we did was watch the lumberjack show. 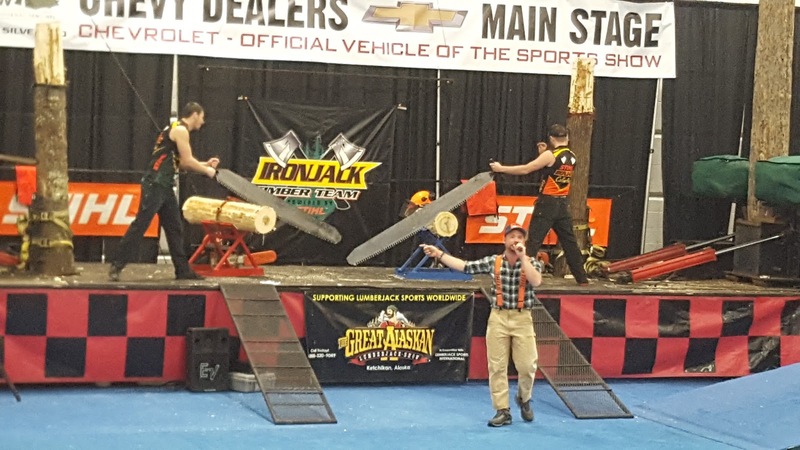 They threw axes, cut trees with saws and axes and finished up with log rolling. Ben actually said "I seriously only thought logrolling was done in cartoons." He's a city boy like his dad. Then, on Thursday night we celebrated his swimming career with all of his teammates at the Waukesha South/CMH swim banquet. The coaches and players all got up and talked about the season. This year the South/CMH swim team took the state championship, so it was an especially festive event. When Ben gave his speech about being one of the "junior walk-on" players, I got a little choked up. I have nothing but admiration for his courage and effort to join a team that late and do the things he did as a JV swimmer. We also joked about how I'd always regretted not lettering in a sport in High School, and here he was a two-time Letterman for the swim team. He even offered to let me have one of his letters. Now I just need to get it sewn to a jacket. Ha! 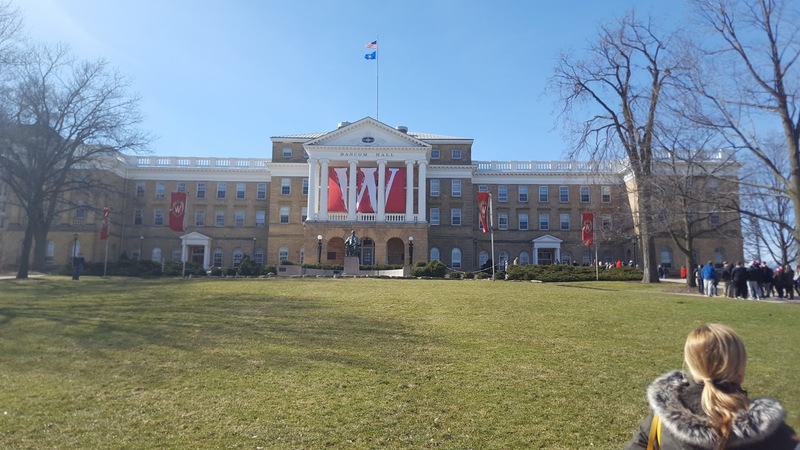 And finally, on Friday we went to Madison to attend the YourUW event that is held for all students that have been accepted as freshman. It was an informational tidal wave, but I am glad I went. In addition to some orientation kinds of things, we got to ask questions from experts in several different areas. It was cool seeing Ben get excited about things like the prospect of a writing fellowship, campus groups and the possibilities of an Honors program. It was weird standing back and letting my 18 year old ask the questions, but I realize that's what needed to happen. The first course in college is Adulting 101. After all was said and done, Ben mentioned he wanted to go to the bookstore and maybe get a sweatshirt or some spirit wear. We went to the Kohl center and got him a T-shirt and it occurred to me that this was a telling sign that this is where he'd chosen to be. So, I think my boy's going to be a Badger, and, after our day Friday, I am totally cool with that. More on this in a later post. Appreciate this time with the one student you still have at home. This is an unprecedented time if you think about it. The older child has ALWAYS been around with the younger. You've never had time with the younger one alone, so use it well. Take time to start dating and getting to know your spouse and friends again. This could include taking a trip or do other significant local things together. Time with both friends and spouses will soon become abundant, so you need to rediscover this person you married, these longtime friends. You need to remember why you fell in love with your spouse or became friends with your friend group in the first place. Don't visit your daughter or let her come home for the first 5 or 6 weeks. This is her/his time to meet new people, find out who they are as a student and get acclimated to their new life. This probably sounds a little harsh, but it's worked for us. So, it's been a good week to be a father to a son. It's part of a good life being father to a daughter and son who I am incredibly privileged to raise.